Chris was born in 1918; his parents lived in Newhaven because his dad was convalescing after being gassed and shot in the left eye in France during World War 1. After moving to Terminus Road in Brighton, Chris attended Stanford Road Senior Boys’ School until he started work at 14 years old as a Commis Waiter at the Albion Hotel (now called Royal Albion Hotel), Brighton. On the 3rd May 1934 as a 16 year old, Chris joined British Railways and then the Royal Artillery on the 1st April 1935 before signing up for the Royal Sussex Regiment on the 1st September 1938 as World War 2 loomed. When World War 2 finished Chris left the Army in 1946 and rejoined British Railways having married Lois Pearl Lade, a Wren serving at Roedean, Brighton at St Martin’s church in Lewes Road, Brighton on VJ Day the 15 August 1945. One of Chris’ favourite pastimes was swimming in the sea all year round off Hove beach at Courtney Gate. In fact this habit helped him to escape from Dunkirk as he swam three miles to a destroyer and was able to serve for the rest of the war. His employer even photographed and interviewed him one morning in January 1963 at 5am for an article for the British Railways Magazine since starting the day with a swim was almost an every day event before Chris set off to work. Chris worked in many regions of British Railways, especially on the famous Pullman trains and after learning his trade as an Attendant he got involved in high profile events particularly during the 1960s. 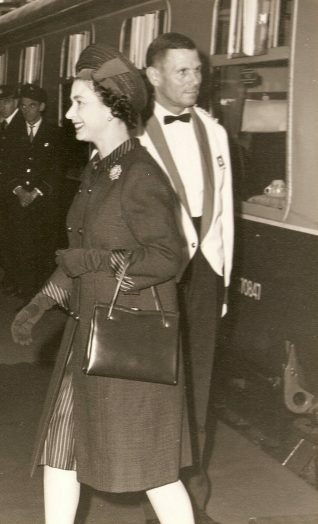 Now trading as British Rail, Chris was proud to be the Leading Conductor for the Royal Train often taking the Royal family to events such as the Derby and Oaks at Epsom races as well as taking care of visiting Presidents, Prime Ministers and foreign royalty. He was also responsible for looking after the family and special guests who travelled on the funeral train which carried the body of Sir Winston Churchill from Waterloo to Bladon, for the final leg of the funeral journey in January 1965. One job Chris spent many years doing was being a Conductor for the Brighton Belle which culminated in his involvement on the last journey taken by the ‘Belle’ on 30 April 1972. 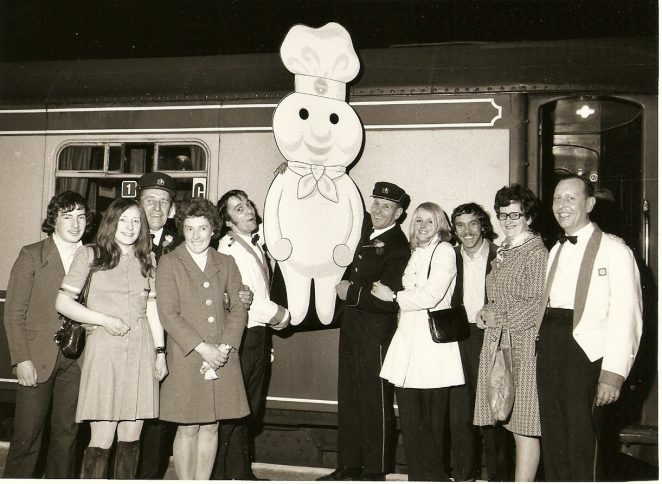 After the ‘Belle’s’ final journey, Chris accepted a move into management and was based at Brighton Station, until he retired in March 1977 after over 40 years service. However, he continued to do a variety of jobs, particularly looking after the elderly and disabled before finally retiring in 1994 from his last job as Caretaker in the block of flats where he lived in Saltdean. He still popped down to his local beach for a swim during his seventies and not until he had a triple heart by-pass at age 80 did this stop. He continued to enjoy life with his two children, four grandchildren and wife Lois, who after 60 years of marriage died in 2006 just 10 months before Chris passed away in 2007. What a long career. I only travelled on the Belle once in the 50s when the supplementary fare was 2/6d. I wonder if Chris ever mentioned a fellow worker called Pamela Watts who still lives in East Brighton. Thanks for your comment John. I am afraid I have no memory of my dad mentioning Pamela Watts. If you are in touch with Pamela naturally I would be interested if she knew my dad and what job she had with BR. What a wonderful story of Chris Lade! I’m impressed with the collection (and condition) of Nick Lade’s archival memorabilia which serves to remind all about our wonderful Brighton Belle. I loved the 1st class carriages with their curtains, table lamps, and white table cloths. Who could not be fascinated by the stewards serving us tea? They poured our tea and milk simultaneously, one pot in each hand, moving perfectly in sync with the train’s rocking motion and never spilling a drop. I wonder if Brighton trains still have such a service? I think they were referred to as ‘Pullman Carriages’. Thanks for your reply John, and I am sure Dad, like me, would appreciate Pamela’s memories of him. Please pass on my best wishes to Pamela when you next speak to her. My dad often spoke about Chris as he worked with him on the Belle – his name was Johnny Robson and he was known as ‘Robbie’ – he died aged 92 in 2010. I still have a Menu and a tray from the last journey of the Belle in 1972. Hi Geraldine, thanks for adding your comment. Like you I have several items from the ‘Belle’ including the menu and tray from the last journey. Was your dad on the last journey? I have quite a few photos of the stewards and expect one might include your dad so if you would like to see them I am sure if you are living local we could organise something.